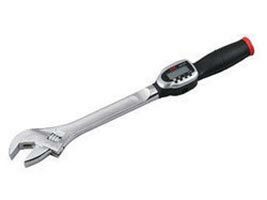 We bring forth premium quality KTC Piping Work Wrench Set, which is a Swedish type wrench. It is hardened by induction and permanently fitted with a knurl. Manufactured using either chrome vanadium steel or carbon steel by our trusted vendors, it is well known for its flexibility and non-corrosiveness. It is designed as per the industry standards and caters to the requirements of our customers spread worldwide. We, Supplier, Exporter and Importer of the product provide you the product at a very competitive price. Authentic torque measurement features that meet ISO standards.